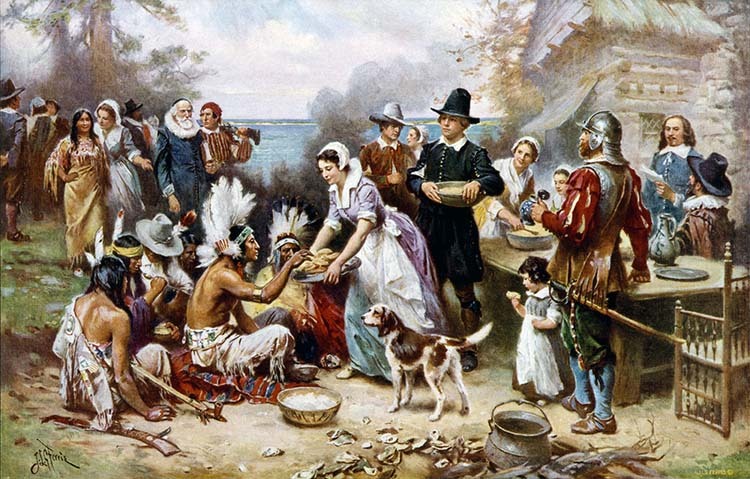 Thanksgiving is based on the colonial Pilgrims of 1621 harvest meal. 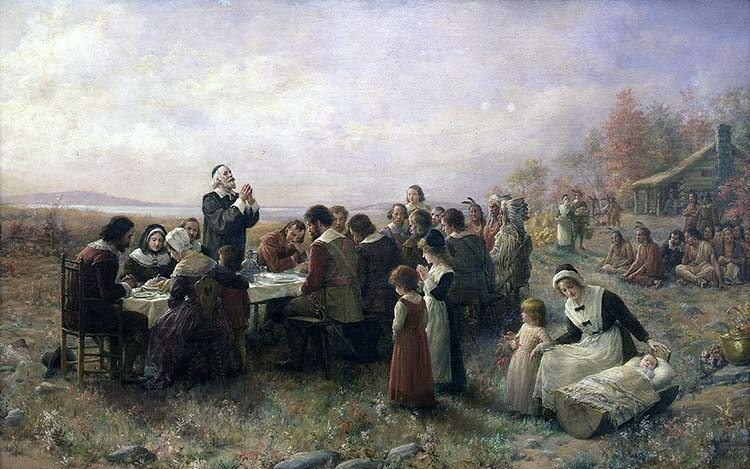 The Pilgrims were so thankful to be in America, to have new homes, away from the oppression of England, and their first successful harvest, that they held a large feast. The celebration continued over many days focusing on prayer, as the original Pilgrims were steeped in their religious beliefs. They believed through their faith and determination, they survived a brutal winter and were blessed with a bountiful harvest. The immigrants were unknowing and unprepared for the upcoming extremes of the new country, and without the help of the Native Wampanoag Indians and their leader, Massasiot, the pilgrims would not have survived their first winter. Less than a year after landing at Plimoth, the Pilgrims had successfully constructed seven homes, three storage facilities and a meeting place to congregate and pray. The Autumn celebration included; venison, seafood, duck, cabbage, corn and squash, there has never been a mention of eating turkey at the initial meal, also cranberry sauce and mashed potatoes had not been invented. The Wampanoag Indians walked for two days to celebrate with the pilgrims, only to discover there was no shelter for them. The Wampanoags built their own shelter after arriving at Plimoth. Between meals and prayer, the group sang, danced and played games. The Wampanoag taught the pilgrims a game involving tossing a small ring onto a pin and the English competed in target shooting, other games were played with the children.